A giant in the online ski and cruise holiday market, Iglu.com Ltd has seen impressive growth over the last five years. After receiving a glowing referral from a former colleague, Finance Director, Lorna Vincent, reached out to Expense Reduction Analysts UK (ERA UK). She contacted Client Relationship Manager, Manoj Pabari, to find out how Iglu’s internal costs and procurement processes might be improved. 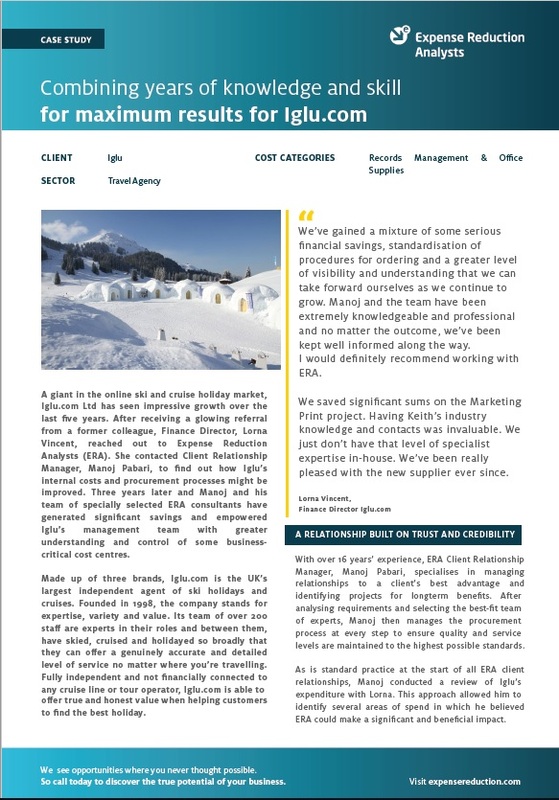 Three years later and Manoj and his team of specially selected ERA UK consultants have generated significant savings and empowered Iglu’s management team with greater understanding and control of some business-critical cost centres. To find out more about how ERA helped Iglu.com, including results, savings and more details from the client, download the full case study now.